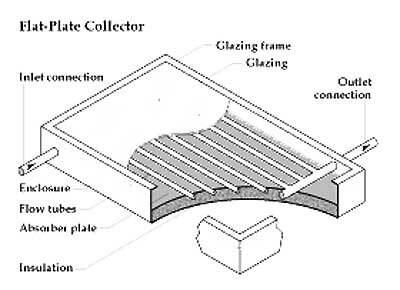 A flat plate collector consists of a thin absorber sheet (of thermally stable polymers, aluminum, steel or copper, to which a black or selective coating is applied) backed by a grid or coil of fluid tubing and placed in an insulated casing with a glass or polycarbonate cover. Fluid is circulated, using either mains or solar electricity, through the tubing to remove the heat from the absorber and to transport it to an insulated water tank, sometimes directly or otherwise to a heat exchanger or to some other device for using the heated fluid. Some fabricants have a completely flooded absorber consisting of 2 sheets of metal stamped to produce a circulation zone. Because the heat exchange area is greater they may be marginally more efficient than traditional absorbers. As an alternative to metal collectors, new polymer flat plate collectors are now being produced in Europe.  These may be wholly polymer, or they may be metal plates behind which are freeze-tolerant water channels made of silicone rubber instead of metal. Polymers, being flexible and therefore freeze-tolerant, are able to contain plain water instead of antifreeze, so that in some cases they are able to plumb directly into existing water tanks instead of needing the tank to be replaced with one using heat exchangers. By dispensing with a heat exchanger in these flat plate panel, temperatures need not be quite so high for the circulation system to be switched on, so such direct circulation panels, whether polymer or otherwise, can be somewhat more efficient, particularly at low light levels. Most flat plate collectors have a life expectancy of over 25 years. The main advantage of flat-plate solar collectors over evacuated-tube ones is their price. And though recent trends in evacuated-tube technology closed part of the gap, flat-plate solar collectors are still a cheaper solution. Climate poses some limitations to the use of flat plate collectors. Freezing conditions may limit the efficiency of this kind of collectors, mostly used in warm and mild climates and - in the case of unglazed collectors – in pool water heating and other less demanding applications.